Some news on that front. Eventually I received my Marital Status certificate and my Police Clearance certificate and put both through their paces by having them signed and certified by the SA ministry of Foreign Affairs and the Taipei Liaison Office in South Africa. In fact, for a nominal fee the South African lady who works there, Maya Du Rand will sort everything out for you. In fact, regarding the police clearance certificate, it's better if you send it directly to her and let her take it from there. You can contact her through the Taipei Liaison Office in Pretoria. She will take it to the criminal records bureau and sit on their butts to get them to hurry the process up and keep it within the promised 20 odd work day time-frame. She's an absolute life saver. Those two documents were the big obstacles as basically anything that goes through the South African government takes ages. An American friend in Taiwan applied for his criminal record clearance from the US via the FBI and had it in hand within four weeks. The AIT got his marital status certificate within a week. 5. Arrival and departure certificate from NIA in Taiwan and proof of residence for 3 years (married applicants) or 5 years (single applicants). 6. Language proficiency certificate, which is either certified proof of Chinese language classes at a government approved language center such as Tai Da, NCKU etc., or the Language proficiency test (which I did and proudly scored 100% in). 7. Tax records proving you have earned twice the minimum Taiwanese salary (NT$ 17 836) or bank records or other proof showing you have cash or assets to the amount of NT$5 million. 9. Two photos, NT$200 and an application form. You also need your passport and some HHR offices require a Chinese chop (seal with your Chinese name). *Note: All foreign documents need to be authenticated by MOFA, translated into Chinese and the translation authenticated by a local court. All my documents were in order except for one snag. My tax records weren't sufficient because my ARC school (as many or most do here) lied on my tax returns. further investigation as to why revealed they do this (my school at any rate) and take the surplus the save on tax by giving in faulty returns and give it back to you at the end of your contract period as your "End of Contract Bonus". Initially I didn't think this would be a problem as married applicants don't have to give in tax records, only proof of work, and even that isn't necessary if you can prove that your Taiwanese family can and does take care of you financially (which is probably the case with foreign brides who mostly don't work, but come here for marriage and as housewives). 1. I was still on a work related ARC and so had to give tax records as proof of income. 2. 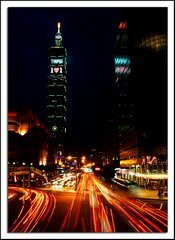 The three year period for married couples is the period you have been married, not your stay in Taiwan. Kiki and I will only be married for three years in February 2010. The helpful staff at the HHR office suggested I apply for a family visa (Joining family residence Visa - JFRV) and return in February next year to apply for citizenship. I was worried that this would reset my clock and I would have to wait another three years before I could apply, but the lady at the HHR office said this is only the case at NIA (for things like APRCs etc. ), but that the HHR office is only concerned with how long you've been married, not how long you've been on a visa or change of visa. She also assured us that as long as we don't leave the country before we apply I wont need to re-apply for a police criminal record or any documents from South Africa. It is the route they recommend as it makes the procedure much smoother and easier, and it's the normal way of doing it - once again, due to experience with foreign brides that aren't in Taiwan on work ARCs. So, that's where we are right now. I applied for a JFRV but I'll do another update for that as I think the info I gained will be useful to people who wish to apply for JFRVs and not necessarily naturalization. Cheers for the comment, Paul. I have some immigration and visa updates coming, but nothing much has happened with my personal situation in a while so I haven't really been updating. I'll get round to it as soon as I can.